I want this period of my life to be over because in this period I don’t know what I’m doing. Having graduated college a year ago without an inkling of a career path, I am often visited by fun new friends like crippling anxiety and existential dread. The media push articles about the growing trend of extended adolescence and the waning likelihood of millennials achieving the American Dream. Naturally, I am seeking a resolution to my ordinary, yet nerve-wracking search for purpose. It would be easy to assume young people in this stage are failing in some way; that millennials procrastinating from making life decisions are lazy, coddled and selfish. But rather than allowing this period of “emerging adulthood” or “extended adolescence” to be a source of insecurity, I am beginning to embrace it as an opportunity to practice careful discernment and to develop a mature prayer life. It is difficult to bring oneself to prayer when one feels lost. Inevitably, I have begun comparing myself to my (seemingly thousands of) friends with their acts together. While studying at Georgetown University, I was fortunate to meet many great Catholics who are now following clear vocations. Their alluring certitude made me wonder: What are they doing that I could try? I reached out to a few of them to ask about their prayer and discernment. I am often visited by fun new friends like crippling anxiety and existential dread. Eileen and Pat got married last October in Boston, and Christian is in his second year at the Jesuit novitiate in the Northeast Province. They are all a year older than I am, and they have worked hard to develop their prayer lives. They are particularly knowledgeable about discernment, the key to Ignatian spirituality. I met Eileen during the spring of my freshman year. I had joined the pro-life group on campus and signed up to staff a table for the group a couple days each week. Eileen stopped by the table with a messy bun and a big purse full of books and Tupperware. She had a unique ability to appear frazzled and calm at the same time. Even though she had a lot going on, she took the time to stop by and welcome me into the club. I met Pat the next year when we shared a shift together at a commons desk in one of the dorms. Our early interactions were just half-joking insults about each other, spurred by a joke about introverts bonding better over insults than small talk. I guess it worked. Struggling in prayer is a personal, even embarrassing, topic, but I have seen Eileen do some awkward interpretive dance to Avril Lavigne’s “Sk8tr Boi” and Pat and Christian each shave only half of their beards before going to a party. And they have seen me dye my hair blue because I lost a bet. So, lucky for me, we are past the point of feeling silly in front of each other. I feel comfortable talking to them about anything. Why not prayer? The primary way to go about Ignatian discernment is with the examen. Eileen, Pat and Christian each recommended it. The examen is a conversational prayer that usually takes about 15 minutes. You sit with God, going through the events of your day, considering your feelings and reactions, answering questions like: Where did you feel most alive today? What was difficult for you to handle? What do you hope for tomorrow? If you are like me, a member of the hopelessly analytical faithful, and you want to learn more about the examen, I suggest reading Jim Manney’s book, A Simple, Life-Changing Prayer: Discovering the Power of St. Ignatius Loyola’s Examen. When asked if they could offer advice to millennials like me, my friends gave simple advice: Give it a try, and be patient. “My biggest piece of advice would be to try it simply because it’s so life-changing,” said Eileen. Eileen and Pat got married last October. Extended adolescence does not have to be an embarrassing in-between time—a jumble of things happening to you before your “real” adulthood begins. It can be an opportunity to live intentionally and to spend time listening for and exploring your vocation through prayer. 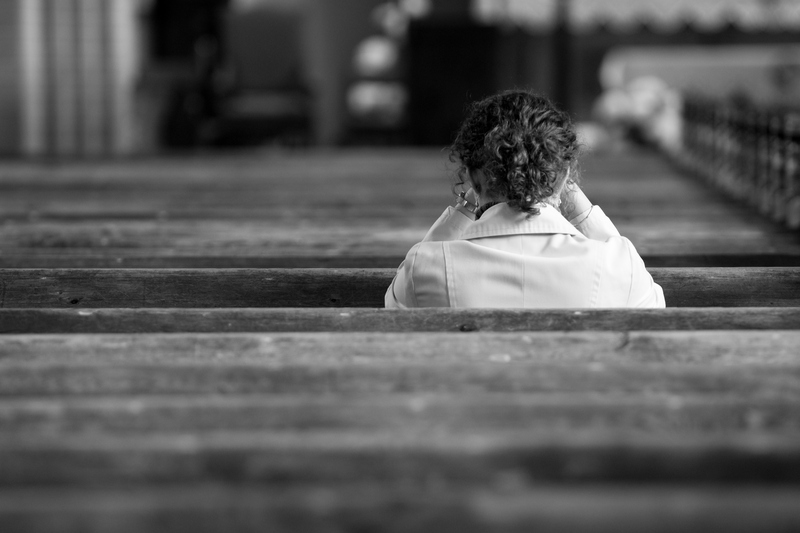 Editor's Note: After writing this article, Teresa accepted a position as an editorial assistant at SmartBrief, Inc. in Washington, D.C.
"A period of uncertainty may be a great time to begin developing your relationship with God." I believe that's true, actually foundationally true and wise. I consider myself to be one of the many who are able to develop relationships with God because of periods of uncertainty, never ending it seems. Uncertainty promotes a constant, and resolute search for the Mysterious One, God, Who is ever eager to play the child's game of "Hide and Seek," wherein either He hides as we seek, or we hide as He seeks. As Scripture points out, God enjoys "playing with the children of men." Yes, God is playful! What is the end result of this heavenly game? For me, at least, it produces a profound reverence for all things Sacramental. I just love all the Sacraments, wherein God hides Himself. But not just the liturgical Seven. God hides every where in sacramental character ready to be found in all the circumstances of life "instituted by God/Christ to give Grace," providing face to face encounters with God/Christ Who as St. Mother Teresa of Calcutta says, "comes in distressful disguises of human need." One person who grasps this perfectly is Holy Father Pope Francis.